Tea Happiness- A blog on tea drinking, tea history, tea industry interviews, NYC tea experiences! : The Orange peel masquerading as a mushroom! The Orange peel masquerading as a mushroom! So after the kids went to bed I tore open the mushroomy package. Still looked like dried mushrooms, but they were more pliable. So I bit one. I was hit with the unmistakable flavor of orange! Guess it is orange peel after all. It was fun to have a mystery ingredient in the house! In the next few days I'll try the tea with and without using the suggested 'recipe'. Stay tuned! The herbs are very intresting. The package has Orange peels,Tinpi/陳皮, and Sanzashi/山査子. 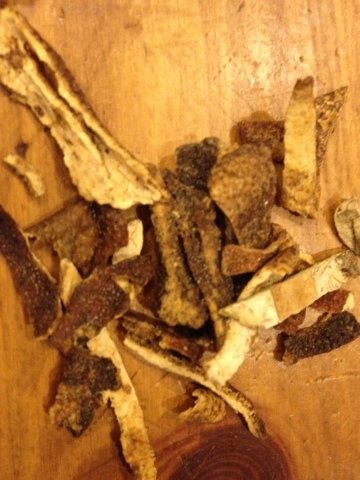 Both herbs are chinese hearbal medicine/漢方薬 and are used as stomachic. very interesting! Thank you for the information!